It takes a long time for me to wake up. Often Ill get up in the middle of night, change the cat box, and go back to bed with no recollection of it. Im an over-thinker and an undecider. I make up words. I went to grad school to pursue music and left grad school to pursue music. I moved 7 times in 3 years between 4 states. I have 300 voices with 300 accents for 301 different moods. I cannot park a car. My wife is the coolest person I know. And she is not a horse. I just released a brand new batch of music. It’s a 6 song EP called “Any Minute Now" and it features a live string section and songs co-written with the #1 songwriters and Grammy winners behind songs by Alison Krauss, Hunter Hayes, Keith Urban. In some ways it feels like I just woke up and while I was sleeping I changed the cat box, recorded 5 albums, and played more than a thousand shows. This time around, It was important to me that the album be an appropriate representation of my music for folks at solo shows and band shows. I’m lucky to have friends who are insanely talented and practiced musicians who are sensitive to my vision. Trey Pollard and I produced this album together at Songwire Studios in Richmond VA. He along with Curtis Fye, Wells Hanley, and Erika Sato really performed magnificently. Did I say magnificently? Because I meant to say MAGNIFICENTLY! I trusted them with these songs and the results are my best work yet. I can’t wait for you to hear it. And I can’t wait to try and outdo it the next time around. Over 1000 shows, 10 years, and 200,000 miles have passed since Dean Fields went on the road to pursue a career in music. During that time his address changed from Richmond VA to Miami to Boston until most recently settling in Nashville TN. Now, he hits the road again to promote his most recent release "Any Minute Now." His recent homecoming has found Fields selling out shows in Richmond VA, as well as nearby Washington DC. 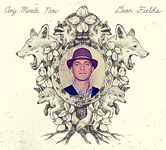 "Dean Fields writes lyrics like Leonard Cohen and sings like Jeff Buckley. It's no surprise that there's a serious buzz on this Virginia singer-songwriter." (Free Times) While continuing to feed his passion for music, Dean is fueled by a single-minded love to perform, sharing the stage with Willie Nelson, Old Crow Medicine Show, Emmylou Harris, Alison Krauss, KT Tunstall, Blues Traveler, Rosanne Cash, Eric Hutchinson, Colin Hay, Bob Schneider, Auqualung, Hootie and the Blowfish, John Hiatt, Cake, Bruce Hornsby, Rusted Root, Madeleine Peyroux, Carbon Leaf, among others. In addition, Fields' maturity as a writer and performer is brought to the fore by some of the region's finest musicians. The band features members of Mandy Moore, Sparklehorse, Agents of Good Roots, KD Lang, Carbonleaf and Modern Groove Syndicate. Dean began his career in 2001 while living in Miami. After being inspired by the abrupt break-up of a long-term love interest, Fields began to document his pain and sadness the only way he knew how….he wrote about it. "I was living in this beautiful place with gorgeous people and amazing nightlife, and where was I? Holed up in a corner room depressed and writing songs." Upon receiving the distinction of "Best of Miami" and performing at the premier Billboard Live, the singer-songwriter made the decision to leave Miami and dedicate himself to developing his craft and performing live. "I just woke up one day and said, 'screw this all I want to do is play music.' And off I went." Influenced by great songwriters like Jim Croce, James Taylor and Lucinda Williams, Fields has blended a mix of folk-alternative Americana to create a sound only unique to him. His natural and melancholy voice stands out from the mix. "He sings with the tender high tenor of Tim Buckley and the plain spoken poetry of Jim Croce. "(Miami Herald) Fields is truly in his element on stage. His live performances showcase his unassuming yet candid personality; an 'ah shucks' sort of charisma audiences are drawn to. They cant help but watch, and listen, and be a part of the experiences unfolding in song. In addition to releasing two albums since taking to the road in 2003 Fields has been showcasing his talents at BMI songwriter showcases in Nashville, Los Angeles, New York and at the BMI Brunch at SXSW. He was also the Southeast Region finalist in the independent music world series in 2004, chosen over a group of 1200 acts and has had his music featured on MTV's Real World, Road Rules and Sorority Life. Fields continues to win over critics and audiences everywhere. "Go so you can say you saw him when."